Khairkhwa has served in a variety of roles for the Taliban in Afghanistan, including as spokesperson for the Taliban government from 1995 to 1996, as the Taliban’s Minister of Interior from 1996 to late October 1999, and as the Taliban’s governor of Herat Province from late October 1999 to December 2001.“JTF-GTMO Assessment,” New York Times Guantanamo Docket, March 6, 2008, 2, https://www.nytimes.com/interactive/projects/guantanamo/detainees/579-khirullah-said-wali-khairkhwa/documents/11. After the September 11 attacks in 2001, Khairkhwa represented the Taliban in meetings with Iranian officials in an effort to rally support against U.S. and coalition forces in Afghanistan. A 2008 assessment from the Joint Task Force at Guantanamo (JTF-GTMO) further suggests that Khairkhwa was a former drug trafficker who had previously been “one of the major opium drug lords in Western Afghanistan.”“JTF-GTMO Assessment,” New York Times Guantanamo Docket, March 6, 2008, 1-2, https://www.nytimes.com/interactive/projects/guantanamo/detainees/579-khirullah-said-wali-khairkhwa/documents/11. Khairkhwa is also allegedly an acquaintance and “long-time family friend” of former Afghan President Hamid Karzai.“JTF-GTMO Assessment,” New York Times Guantanamo Docket, March 6, 2008, 3-5, https://www.nytimes.com/interactive/projects/guantanamo/detainees/579-khirullah-said-wali-khairkhwa/documents/11. Prior to taking up with the Taliban in Afghanistan, Khairkhwa had spent time as a refugee in Pakistan, according to records from Guantanamo. Records indicate that Khairkhwa was previously the leader of his tribe, the Popalzai. While serving as the Taliban’s governor of Herat Province from 1999 to 2001, Khairkhwa’s deputy was allegedly responsible for all Arab and military affairs in that province. Khairkhwa denied knowledge of any militant activities in Herat Province during his tenure as governor, including training camps, recruitment, and weapons procurement.“JTF-GTMO Assessment,” New York Times Guantanamo Docket, March 6, 2008, 2-3, https://www.nytimes.com/interactive/projects/guantanamo/detainees/579-khirullah-said-wali-khairkhwa/documents/11. 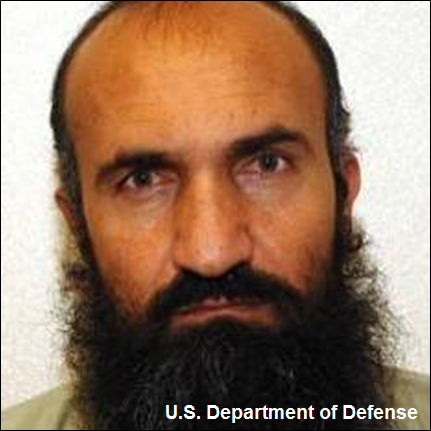 Nonetheless, Khairkhwa allegedly met with Mullah Omar twice while serving as governor of Herat Province, including one occasion where he allegedly discussed militant recruitment strategies in Herat.“JTF-GTMO Assessment,” New York Times Guantanamo Docket, March 6, 2008, 3, https://www.nytimes.com/interactive/projects/guantanamo/detainees/579-khirullah-said-wali-khairkhwa/documents/11. Khairkhwa also allegedly controlled access to and from a militant base in Herat Province, described by the JTF as “one of UBL [Osama bin Laden’s] most important bases” in Herat.“JTF-GTMO Assessment,” New York Times Guantanamo Docket, March 6, 2008, 6-7, https://www.nytimes.com/interactive/projects/guantanamo/detainees/579-khirullah-said-wali-khairkhwa/documents/11. On October 3, 2001, Khairkhwa traveled with three other Taliban representatives to the Afghan-Iranian border to meet with Iranian officials.“JTF-GTMO Assessment,” New York Times Guantanamo Docket, March 6, 2008, 3, https://www.nytimes.com/interactive/projects/guantanamo/detainees/579-khirullah-said-wali-khairkhwa/documents/11. According to findings by the JTF, the meeting was set up by Tehran and may even have been set up by Iran’s Islamic Revolutionary Guard Corps (IRGC) in particular. During the meeting, Iranian officials allegedly offered to organize a coalition of Northern Alliance and Taliban fighters to counter U.S. and coalition forces in Afghanistan. Iran also allegedly offered to allow foreign fighters to travel through Iran into Afghanistan to join the fight against U.S. forces there.“JTF-GTMO Assessment,” New York Times Guantanamo Docket, March 6, 2008, 3, https://www.nytimes.com/interactive/projects/guantanamo/detainees/579-khirullah-said-wali-khairkhwa/documents/11. In January 2002, Khairkhwa claims to have traveled to Chaman, Pakistan, and contacted Wali Karzai, brother of former Afghan President Hamid Karzai, to negotiate his surrender to U.S. and coalition forces.“JTF-GTMO Assessment,” New York Times Guantanamo Docket, March 6, 2008, 3, https://www.nytimes.com/interactive/projects/guantanamo/detainees/579-khirullah-said-wali-khairkhwa/documents/11. The following month, Khairkhwa was arrested by Pakistani border patrol officials while at the home of another Taliban official. After more than two weeks in Pakistani custody, Khairkhwa was transferred to U.S. custody in Quetta.“JTF-GTMO Assessment,” New York Times Guantanamo Docket, March 6, 2008, 3-4, https://www.nytimes.com/interactive/projects/guantanamo/detainees/579-khirullah-said-wali-khairkhwa/documents/11. On May 1, 2002, Khairkhwa was transferred to Guantanamo.“JTF-GTMO Assessment,” New York Times Guantanamo Docket, March 6, 2008, 4, https://www.nytimes.com/interactive/projects/guantanamo/detainees/579-khirullah-said-wali-khairkhwa/documents/11. Khairkhwa spent 12 years in Guantanamo, and was repeatedly assessed to be an enemy combatant, posing a high risk to the United States, its allies, and interests. In 2008, the JTF recommended Khairkhwa for continued detention under supervision of the U.S. Department of Defense.“JTF-GTMO Assessment,” New York Times Guantanamo Docket, March 6, 2008, 1, https://www.nytimes.com/interactive/projects/guantanamo/detainees/579-khirullah-said-wali-khairkhwa/documents/11. On May 31, 2014, however, Khairkhwa was transferred from the U.S. detention center in Guantanamo Bay to Qatar alongside four other Taliban detainees. The move came as part of a negotiated exchange for the release of U.S. captive soldier Sgt. Bowe Bergdahl. At the time of the their transfer, the so-called Taliban Five—including Khairkhwa—were considered to be sufficiently dangerous as to require them to remain in detention.“Report on the Inquiry into: The Department of Defense’s May 2014 Transfer to Qatar of five law-of-war detainees in connection with the recovery of a captive U.S. soldier,” Committee on Armed Services, December 9, 2015, https://armedservices.house.gov/sites/republicans.armedservices.house.gov/files/wysiwyg_uploaded/Report%20on%20the%20Inquiry%20into%20the%20Taliban%20Five%20Transfer_0.pdf. As of June 2013, Khairkhwa was considered to be “the least likely of the five to become involved in military operations” if able to reengage, but would probably “remain a Taliban political leader.”“Report on the Inquiry into: The Department of Defense’s May 2014 Transfer to Qatar of five law-of-war detainees in connection with the recovery of a captive U.S. soldier,” Committee on Armed Services, December 9, 2015, https://armedservices.house.gov/sites/republicans.armedservices.house.gov/files/wysiwyg_uploaded/Report%20on%20the%20Inquiry%20into%20the%20Taliban%20Five%20Transfer_0.pdf. Although the Memorandum of Understanding (MOU) between the United States and Qatar was classified regarding the terms for Taliban detainees released to Qatar, the U.S. House Committee on Armed Forces was able to note that the MOU specified “monitoring” efforts to be undertaken by Qatar, as well as the prohibition against detainees’ “travel outside Qatar,” “engaging in conduct that will raise money for prohibited causes,” and “threatening American interests.”“Report on the Inquiry into: The Department of Defense’s May 2014 Transfer to Qatar of five law-of-war detainees in connection with the recovery of a captive U.S. soldier,” Committee on Armed Services, December 9, 2015, 76, https://armedservices.house.gov/sites/republicans.armedservices.house.gov/files/wysiwyg_uploaded/Report%20on%20the%20Inquiry%20into%20the%20Taliban%20Five%20Transfer_0.pdf. The U.S. House Committee on Armed Forces determined in December 2015 that members of the Taliban Five have been engaged in “threatening activities” since their transfer to Qatar “not unlike their activities before they were detained on the battlefield.”“Report on the Inquiry into: The Department of Defense’s May 2014 Transfer to Qatar of five law-of-war detainees in connection with the recovery of a captive U.S. soldier,” Committee on Armed Services, December 9, 2015, https://armedservices.house.gov/sites/republicans.armedservices.house.gov/files/wysiwyg_uploaded/Report%20on%20the%20Inquiry%20into%20the%20Taliban%20Five%20Transfer_0.pdf. In January 2015, the U.S. Pentagon said that there was reason to believe that “at least one” member of the Taliban Five was involved in “some activities… centered around potential reengagement.” In March 2015, a news outlet reported that “at least three of the five Taliban leaders… have tried to plug back into their old terror networks.”“Report on the Inquiry into: The Department of Defense’s May 2014 Transfer to Qatar of five law-of-war detainees in connection with the recovery of a captive U.S. soldier,” Committee on Armed Services, December 9, 2015, 75, https://armedservices.house.gov/sites/republicans.armedservices.house.gov/files/wysiwyg_uploaded/Report%20on%20the%20Inquiry%20into%20the%20Taliban%20Five%20Transfer_0.pdf. Khairullah Khairkhwah“KHAIRKHWAH, KHAIRULLAH,” Interpol, accessed June 21, 2017, https://www.interpol.int/en/notice/search/un/1427436. Khirullah Said Wali Khairkhwa“Khirullah Said Wali Khairkhwa,” New York Times Guantanamo Docket, accessed June 21, 2017, https://www.nytimes.com/interactive/projects/guantanamo/detainees/579-khirullah-said-wali-khairkhwa. Khirullah Said Walt Khairkhwa“Khirullah Said Wali Khairkhwa,” New York Times Guantanamo Docket, accessed June 21, 2017, https://www.nytimes.com/interactive/projects/guantanamo/detainees/579-khirullah-said-wali-khairkhwa. Khair Ulla Said Wali Khairkhwa“Khirullah Said Wali Khairkhwa,” New York Times Guantanamo Docket, accessed June 21, 2017, https://www.nytimes.com/interactive/projects/guantanamo/detainees/579-khirullah-said-wali-khairkhwa. Mullah Khairullah Kharikhwah“KHAIRKHWAH, KHAIRULLAH,” Interpol, accessed June 21, 2017, https://www.interpol.int/en/notice/search/un/1427436. Wali Herat“JTF-GTMO Assessment,” New York Times Guantanamo Docket, March 6, 2008, 1, https://www.nytimes.com/interactive/projects/guantanamo/detainees/579-khirullah-said-wali-khairkhwa/documents/11. Khairullah Khairkhwa is subject to EU sanctions.EU Sanctions List, accessed June 21, 2017, http://ec.europa.eu/external_relations/cfsp/sanctions/list/version4/global/global.xml. Khairullah Khairkhwa was listed by the United Nations as an individual associated with the Taliban on January 25, 2001.“Security Council 1988 Sanctions Committee Amends Fourteen Names on Its Sanctions List ,” U.N. Security Council, September 7, 2016, https://www.un.org/press/en/2016/sc12510.doc.htm. Khairullah Khairkhwa is a U.N.-sanctioned senior Taliban leader based in Qatar.